Lasagnette, as its name suggests, is a smaller (or rather, narrower) version of lasagna. Like regular lasagna pasta, it can be made with straight or waved edges. 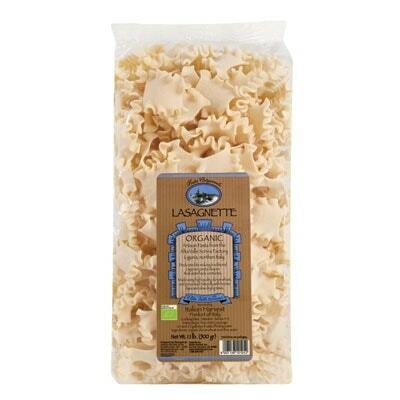 This Lasagnette by Alta Valle Scrivia: Organic, however, has beautifully waved edges, which is perfect for any type of sauce. How to cook it? You can use it like the traditional lasagna sheets. Assemble them in a layer alternately with ragu and besciamella sauce. You can also simply use it like any ribbon pasta, which is to combine or toss it with the sauce or other ingredients. This organic pasta is also great with various kinds of seafood pasta sauce such as mussels and prawns with garlic, pepper, white wine, and extra virgin olive oil. My niece loves this with Bolognese sauce and lots of carrots.